Lowdown: A live (+CGI) version of the same old story. For reasons explained further below, I shall adopt the bullet point style for this specific review. Big name actors: Cate Blanchett, Richard Madden (available here since dying in the role of Game of Thrones' Rob Stark), Stellan Skarsgård, Derek Jacobi and Helena Bonham Carter to start with. Great names, severe underutilisation. Big name director: Kenneth Branagh. I took it for granted that this means a brand new interpretation of the old story, but no; there is nothing new here, just a very big budget live remake of the old story. As in, a pretty much one to one remake of the old story. Looks wise, this is a spectacular event. Colorful and rich with amazing costumes, as attested by a guy who never notices these things. 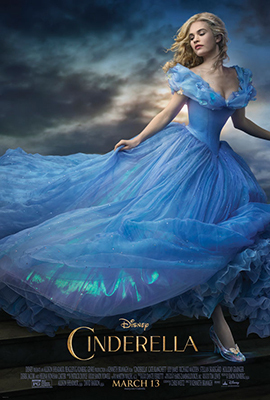 Lily James, in the lead as Cinderella, successfully carries on being annoying from Downton Abbey. So that's Cinderella for you: beautiful to look at, but empty inside, devoid of any meaning. Unless, that is, you're picking up on the very old agenda items here - that women's only salvation come from the men who rescue them, that women need to dress up to impress those men, and that silly looking high heel shoes are well worth wearing because of the men these sort of things attract. Best scene: I will hand it to Cinderella, the special effect scene where the pumpkin coach turns back into a pumpkin is very well crafted. But other than that and a few clever shots, there are no traces of Branagh brilliance to be found; Cinderella is commercial through and through. Overall: 2.5 out of 5 lovely to look at but empty on the inside crabs.